A Christmas present arrived early over the weekend. Normally we would leave the gifts till Christmas day to open. However the sweet aroma from the turquoise coloured box proved too hard to resist. It was Santa's Cottage ($59.90) that greeted us when we opened the box. A chocolate sponge and truffle cream cake on a bed of fresh snowy cream, the cake comes complete with Santa and his reindeers making one his Christmas delivery. The Christmas Log cake is a must for Christmas Gathering. The Log Cake symbolizes the coming of Winter. Today it is associated as a customary Christmas Dessert. Who is the Reindeers pulling? The Santa's Cottage features the iconic Santa Clause and his reindeers. and a snowman greeting Santa at the door. Don't forget the Christmas Tree. The Santa's Cottage is appealing to the kids. We could not simply wipe the gleeful smile on our face when we saw it. 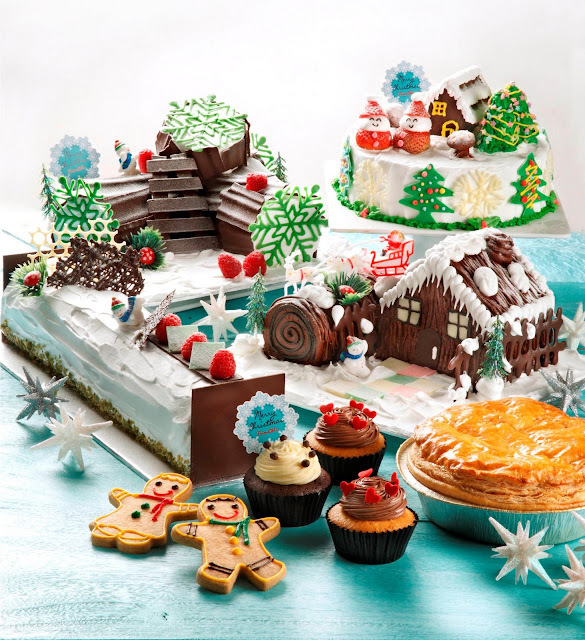 The Santa's Cottage weighs about 1.2 kg and we reckon it should serve a party of 15 or more. Taste wise, we love the Chocolate textured sponge cake. It does not taste too sweet and is suited to the palate of a child. Leave the Chocolate fences for the children. They would love it! It was all smiles after we had our fill. Prima Deli Christmas collection is now at all Prima Deli outlets. 25% off for orders from 21st Nov to 12th Dec ( Log cakes above 1 kg &Santa's Cottage )10% off for selected orders from 13th Dec to 25 Dec.